Experience the real “Land of Smiles” in a serene town of Northern Thailand where you will stay in a small forest compound surrounded by mango trees. Nestled among rice fields and the quiet hum of daily life, this town neighbors the bustling Chiang Mai night market. Stroll through lines of vendors for a total sensory experience; immerse yourself in the appetite-inducing smells, regional fruits, stunning silk tapestries, and even sizzling fried insects. With our advantageous location, remove yourself from the bustle in just a short walk up the mountain to take in spectacular views of the valley below. Your team will participate in an ongoing effort to decrease certain health concerns in the villages we work in. The team will treat remote indigenous groups of the Akha, high in the Chiang Rai mountains. Other patient populations include local migrant workers, as well as refugee populations, often from bordering Myanmar, who are left outside of the medical system. IMR believes that every child should have inalienable rights and protections to prevent them from situational slavery; some patients will be rescued victims of these unfortunately prevalent circumstances. You will stay in a modern, comfortable hotel in Chiang Mai throughout the trip. In the evenings you and the team will be able to explore the city and take part in the many events surrounding the Lantern Festival. All transportation to and from clinic sites will be included and provided by safe, trustworthy drivers. Some travel times to clinics may be longer than others, but you won't want to miss the stunning views of the hillsides and towns as you ride throughout Thailand. During your stay and to coincide with IMR’s year of festivals, your team will attend Thailand’s stunning Loi Krathong and Yi Peng festival! During this time of year, a celebration based on the Thai lunar calendar, people decorate their homes and craft baskets made from flowers, leaves, and lights which they then float on the river. 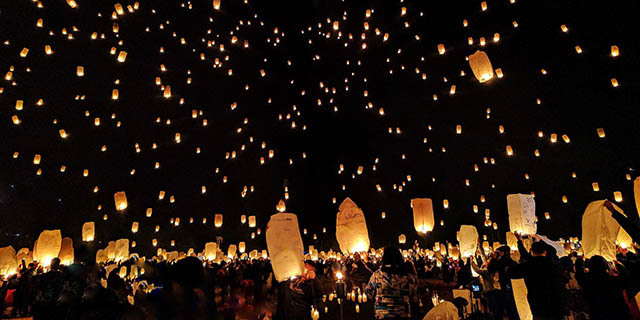 You’ll have the opportunity to send floating lanterns up into the sky as well, joining thousands of others that light up the sky for miles around! You're venturing around the globe, have you considered extending your stay a few additional days to visit some of Thailand's top spots? Join IMR on an exclusive three-day extension! Spend seven days immersed in the culture of enchanting Thailand, with a once in a lifetime opportunity to be part of the country’s world famous Lantern Festival! Thailand’s religious celebration of Loy Krathong is preceded by the equally festive celebration called Yi Peng, or The Lantern Festival. During Yi Peng, thousands of beautiful floating lanterns are released into the sky, symbolizing letting go of the ills and misfortunes from the previous year. You and the team will fly into the Chiang Mai International Airport on November 9th and transfer to your hotel. The required arrival to your hotel is 5:00pm on November 9th. If you are flying on an IMR group flight your airport transportation will be provided for you. If you are flying independently and want to be included on the scheduled airport transfer, please contact us. Upon arrival, you will meet with your team and team leader for a required team orientation to discuss clinic roles, review protocols and gain insight into the communities and populations you will be serving. Enjoy breakfast at your hotel before departing for your first day of clinic at a nearby community! After clinic, you will return to your hotel for a group dinner. Enjoy breakfast at your hotel in the morning and a free afternoon to tour Chiang Mai. In the evening, you will have the unique opportunity of taking part in the Yi Peng Festival where the city will fill with people as they light candles in lanterns and set them free in the sky. Watch as thousands of lanterns are let loose to pay respect to the Buddha and wish yourself a good year. Legend has it, if your lanterns floats into the sky and disappears in the night, you will have a year full of good luck. After an exciting evening of setting free lanterns, wake up early to depart for another day of clinic! You and the team will treat remote indigenous groups of the Akha, high in the Chiang Rai mountains. Other patient populations include local migrant workers, as well as refugee populations, often from bordering Myanmar, who are left outside of the medical system. Enjoy breakfast at your hotel in the morning and a free afternoon to tour Chiang Mai. In the evening, you will have the unique opportunity of taking part in the Loy Krathong Festival. This festival fall on a full moon day and is celebrated nationwide. Go into the city to watch as thousands of people gather at the river to release lotus-shaped baskets with flowers and candles into the river. This festival is a tradition amongst the people of Thailand as they gather each year to set free the floating candles in an attempt to set free their fear and hatred. Taking part in this cultural experience will be a life changing and eye opening opportunity for you and your fellow team members. Continue serving various communities throughout the neighboring towns of Chiang Mai and Chiang Rai. Each day, breakfast will be provided at your hotel and lunch in clinic. In the evenings, you and the team will be free to go into the city to explore and watch as more people set free lanterns and floating baskets. Enjoy breakfast at your hotel then bid farewell to beautiful Thailand as you head to the airport for your international flight home. Pay 2,000 and complete your application to secure your place as a TEAM MEMBER! Pay 2,000 of the total cost by the Early Bird date AND upload/complete all of your required documents and forms receive $200 off the cost of your trip. To confirm your space on the team: Pay 2,000 of the total cost AND upload all of your required documents and forms! Unfortunately, eligibility for the $200 savings on this trip is no longer available after Aug 12th, 2019. Before Aug 12th, 2019: YES! IMR will arrange your international flight on a "group" ticket at your request! Pay 2,000 of the total cost AND upload all of your required documents and forms to be eligible to fly on the international group ticket. YES - We need your help to take IMR supply bags internationally to Thailand – Lantern Festival! Take 2 supply bags for IMR both ways to Thailand – Lantern Festival. IMR Group Flight: In order to qualify for the IMR Group Flight, you will need to reach 50% of the required donation on or before Aug 12th, 2019. Early Bird Special: A discount of $200 is awarded to team members who raise / pay 50% of the required donation on or before Aug 12th, 2019.